Therasphere Meteor Sensory Balls are squeezable meteor shaped balls that bounce randomly and erratically which activates the flashing colored lights. 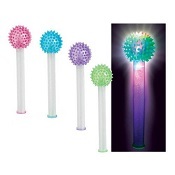 These flashing meteor sensory balls are fun to use and great for sensory stimulation. 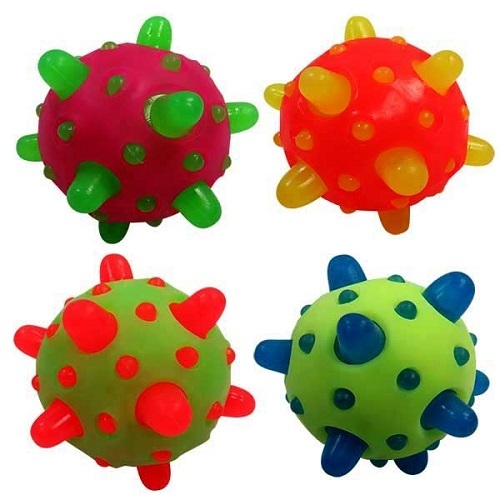 This knobby ball has soft spikes provide tactile sensory stimulation Simply bounce or tap the balls to get them flashing. Great for hand-eye coordination. Can also be used as a textured massage ball. Bright, colorful and excellent fun in the light and the dark! Simply bounce these balls or tap them against your hand to get them flashing! Great for encouraging throwing and catching practice as well as hand eye coordination. Their soft spikes also give them an uneven and unpredictable bounce.